Slow starts, better finishes. All last year was about making progress. It wasn’t a straight line, but it was real, I believe. Keep it rolling! In some of those plays, the unreal height/length/athleticism combo of Edmunds makes the difference in the play. The interception against the Dolphins, for instance. Human beings aren't supposed to be able to MAKE those types of plays. You can tell by watching Tannehil that Edmunds isn't even a consideration for him in that play, but because of Edmunds' wingspan, the result is a turnover instead of a completed pass. It's true that Edmunds needs to improve mentally. What 20 year old player doesn't? But his physical gifts give him the POTENTIAL to be an all-time great. One thing I'd like to see in year two: The development of a 3rd down sub-package that has Edmunds lined up as an edge rusher. He did this a bit in college and was successful. You can see in the last play of the highlight video that he has legitimate pass rushing skills. I think with his size, length, and athleticism, he absolutely has the ability to contribute as a pass rusher to an uncommon degree for a middle linebacker. He’s certainly got the tools to come off the edge in some packages. I liked that they sent him up the middle as often as they did...the shortest distance, and all that. If you have a stud you try to use him in as many ways as you can. I think the game will slow down for him next season, and expect some great stuff. A 20 year old kid learning a new position on the fly in the NFL. I'm happy with his progress. Next year he's going to be MUCH more comfortable with the play book and with his role it it. He's going to react much faster. The kid is only 20. He looked great at times and lost at times. Fact is at least two rookie linebackers outplayed him and the Bills gave up a 3rd round pick to move up 6 spots to get him. The 3rd round pick could have been a C, TE, or WR. Too much to move up 6 spots. But past is the past. He seemed to get better as the season went along. Again, he is only 20 and at this point looks like he could be the anchor on defense for years to come. Like the last 3-4 plays in that video is what I want to see a lot more of next year. One play he torpedos through the hole to stop the RB. Another play he comes off the edge and destroys the RB to get to the QB. His sack through the blocker was great. Also his 2nd INT showed his athleticism. He had to explode to the ball and reach behind him with one hand to pull the ball back towards him. Great coverage. Super excited about our young linebackers. Fact is at least two rookie linebackers outplayed him and the Bills gave up a 3rd round pick to move up 6 spots to get him. The 3rd round pick could have been a C, TE, or WR. Too much to move up 6 spots. Isn't a hindsight a fantastic thing. I'm even more excited by him than Allen at this point, to be honest. Just because I view Edmunds as a lock. The more confident he becomes, the more we'll see him picking people off and lighting people up. And this, to me, is why "complaints" about Edmunds' play this season are so short-sighted. I've said it in other threads -- the Bills basically got a "free" year of coaching this raw kid and his potential is through the roof. 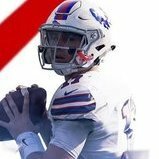 You've got some posters who want the Bills to take chances on being great, but don't see that them getting Edmunds is exactly that sort of a move. He also showed a knack for forced fumbles.. which would be great off the edge. I wouldn't be opposed to having him play more hybrid OLB/MLB to get an idea of what position he best serves us getting reps in future seasons. Excited for him to make a big jump this year. People love to complain, but just like anything in life, there is a learning curve. Most rookies drafted as high as him do look lost at times & great at times seeing as he is still very young & still growing I'd say the 3rd will be totally worth the move up unlike the Watkins move was . This kid not only has the Bills staff behind him showing him where to grow within the position but he also has his dad with all his experience to help him along this off season watching tape to tell him where he needs to improve so i believe once that light goes on he will be a monster ! He was up and down (as expected) but trending upwards as the season went on. Stoked to see what he'll do next year. It's pretty cool that we had our QB and "Defense QB" simultaneously have their rookie seasons together, excited to see what their next levels are in September. He got caught up a lot in the motion plays that teams like NO, LAR, and LAC run quite often. Teams were gashing us on reverses and also fake reverses as he was too often letting linemen get to the second level. So that is definitely something he'll need to work on. The other thing was when he was a deep lying backer in Tampa 2 he was late picking up in breaking routes quite often. Fixable things - just needs to play faster in those situations. He doesn't seem to have issues with tackling, play speed, pad level etc. He has a 2nd gear that is probably near the top of the league for a guy his size, so closing speed isn't an issue. Seems to have some pass rush ability, but that takes time for a linebacker to learn. Overall though he made some plays (2 INTs 2 sacks and 2 FF), and he made some mistakes. I thought a good first year for a rookie MLB.